Penn Central GP40 No. 3181 with the rare Red and white mating worms logo northbound at New Lexington. 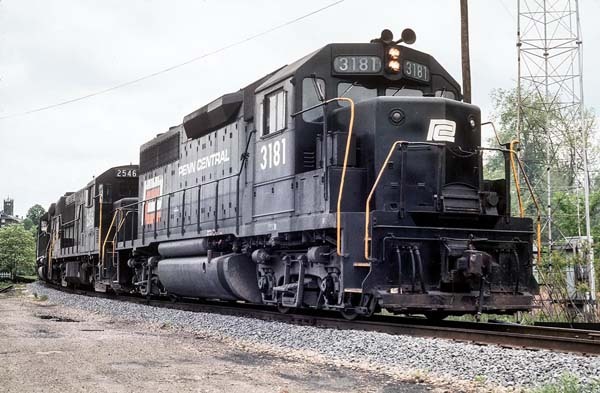 There had been criticism of the black and white Penn Central logo scheme. This was an attempt to add some color. There were a group of sixteen GP40s plus an RS-3 No. 5585 with the orange logo. The photo was taken near the C&MV (Pennsylvania Railroad) junction with a clean PC unit to boot. Photo by Jon Bentz, 1971. Baltimore & Ohio torpedo tube GP9 No. 6618 (originally B&O 3425) switching the B&O freight house near Columbus Union Station. The train is passing under the Fourth Street Bridge. 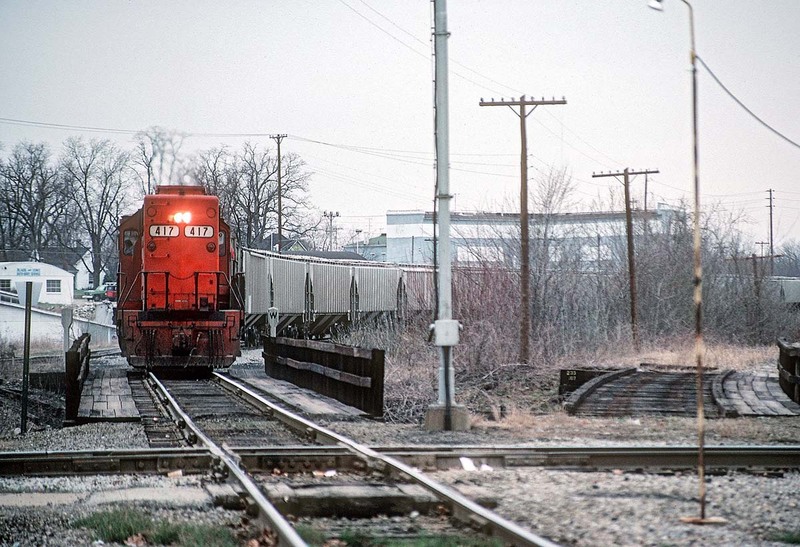 On the right of the locomotive can be seen the Thrid Street Bridge and behind that Union Station. Note the caboose has plywood sheathing. William B Westhoff writes “You can almost smell the exhaust and hear the creak and screech of those long cars being coaxed through the turnouts. Check out the Targets on the switch stands. Note that they are pointing different directions from the switch… which one is correct? According to the old PRR track standards book CE 78 the target farthest away from us in the photo is the correct one. The high point should be pointing away from the switch it is protecting. You’ll see it both ways all the time. 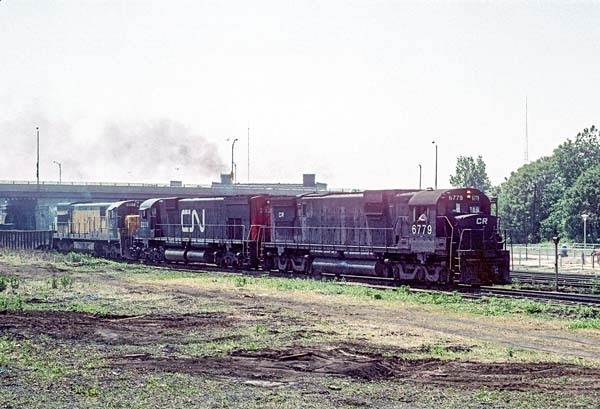 This standard was carried through Penn Central and Conrail. Photo by Jon Bentz, 1977. The remains of the Marble Cliff Quarry engine house with their center cab Plymouth sitting in it. The concrete structure is the base of the water tank from steam days. The rock crusher / loader is in the background. The camera is looking north toward Trabue Rd. 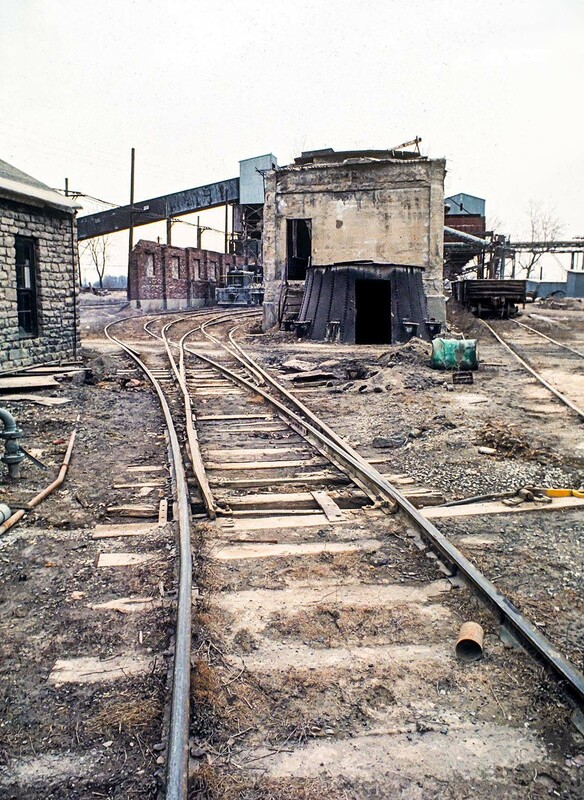 The Marble Cliff Quarry had a small yard for exchanging lime stone hopper cars with both the Pennsylvania Railroad and New York Central (T&OC). B&O E8A No. 1448 backs down the PRR – Little Miami main to reverse and run through the interchange track at LM Cabin (Scioto Tower) and back onto the C&O main line. A business car is in this eastbound consist. Photo by Jon Bentz, 1969. 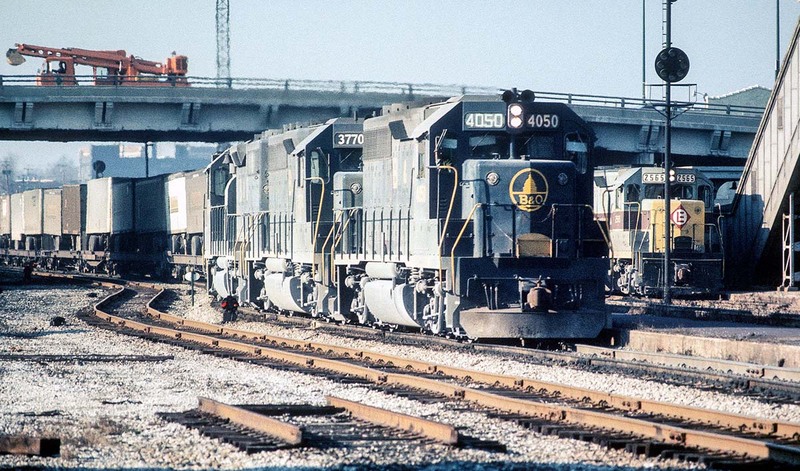 A train of DEEX (Detroit Edison Company) hoppers enters the north end of Buckeye Yard. Normally the train would pass through Columbus heading south. 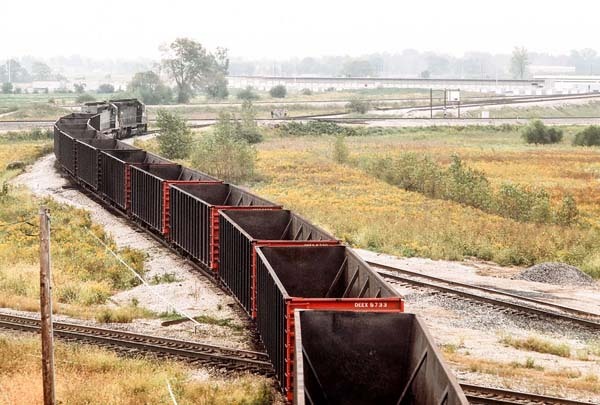 If there was a shortage of capacity or crews, or if Conrail was ahead of schedule on Detroit Edison’s inventory needs, it was not unusual for them to store the DE trains at Buckeye for hours or days. If the wait was more to the days end, a yard crew would often shove the train out to the Hilliards Yard to wait. The photographer is standing on Scioto-Darby Creek Road. Photo by Jon Bentz, 1976. 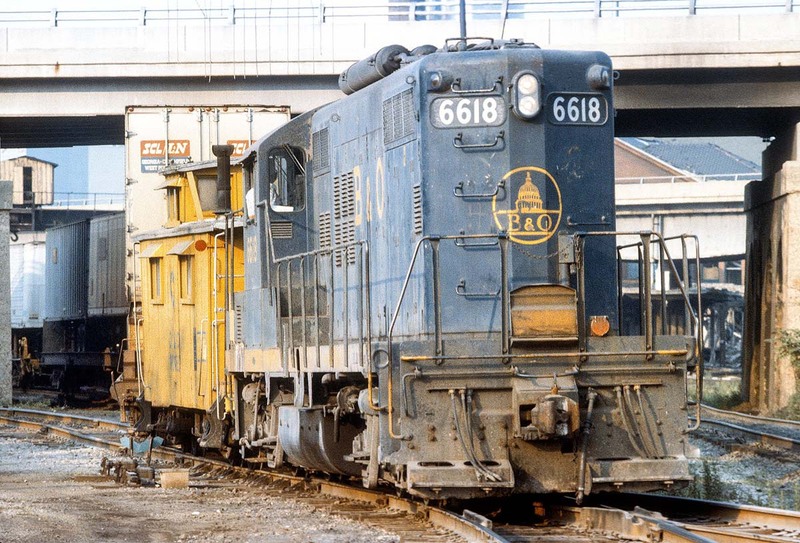 Baltimore & Ohio GP40 No. 4050 is eastbound passing Akron Union Station. Detroit Toledo & Ironton No. 417 is at Washington Court House. The DT&I is using the former B&O line from Washington Court House to Chillicothe. There was a 3% grade around Greenfield on the old line to Jackson that was an operating headache. To the right is the old DT&I right of way. Photo by Jon Bentz, 1981. Ex-Pennsylvania Railroad now Conrail C630 No. 6779 is eastbound with the Fourth Street Bridge in the background. 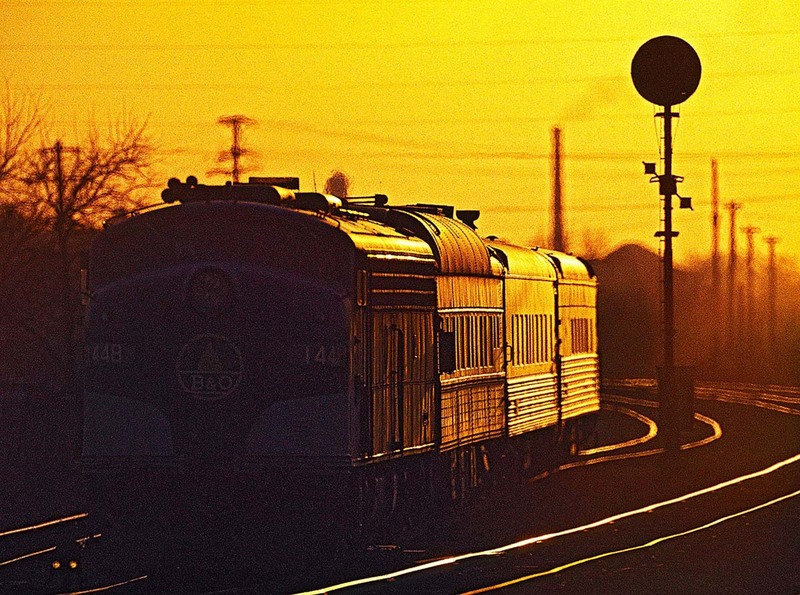 A Chicago North Western U30C is tagging along. The camera is looking northwest.